Mayhem Wheels development was imminent as we accepted the missIon to create a brand that provides unique styling, precision quality and substantial allure. Our tactical approach to constructing the industry's most superior products resulted in a radically durable wheel that touts the highest load ratings for real world applications. Targeted for trucks, Jeep and SUV fitments, we deploy a wide variety of sizes and fitments which supply a custom look that's unmistakable. 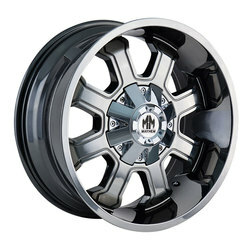 Liberate your vehicle with a set of Mayhem Wheels. Fierce Attitude M T is Goodyear's aggressive all-terrain tire built for both adventure and looks that one can drive in style on highways and trails. Contemporary sidewall design for enhanced for a stylish appearance. Rugged mud terrain tread pattern helps provide traction in deep mud conditions. 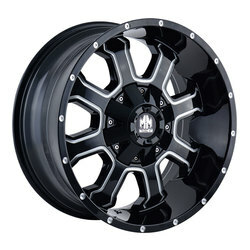 Rim flange protector helps protect rims from accidental curb damage. Staggered shoulder blocks to help enhance grip for off-road driving.